The Baakens Valley is a unique natural resource within Nelson Mandela Bay. 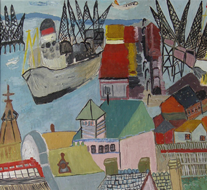 Selected artworks show past and present scenes of the valley, the harbour and surrounds. Included on show are works by 19th century artist and explorer, Thomas Baines, as well as contemporary works by Robert Brooks, Betsy Fordyce, Trevor Melville, Alexander Podlashuc and Fred Page. Along with the colourful paintings, black and white photographs by local photographers Marc Shoul, Rob Duker and Tim Hopwood will be included.